“They’re hard, like porcelain,” a friend said, referring to her recently reconstructed breasts. “Do you want to see them?” she asked. I said no. She showed me anyway. “Feel this,” she said. Gently pressing a small spot with two fingertips, I felt her breast, the way I might have touched a dead fish. “It’s soft. Like memory foam.” I was surprised. “They’re beautiful,” I said, admiring their perfect roundness, and grateful not to have to contend with the gutted ruins I had expected. Gutted ruins came two days later. On the photography field trip. Ten photographers in three cars careening across the countryside, stopping to shoot old farms, demolished derby cars, and tiny towns that had seen better days. And the abandoned farmhouse somewhere off NY Route 96 near Ovid. It stood among tangles of thorny shrubs and gnarled trees. We emptied out of the car and padded carefully on spongy ground toward it, behind our cameras, all trained on the house like we were attacking it. Someone tried the doorknob. Not locked. The others went through the door, crept into every room and up the stairs. I held back. It was someone else’s property. Someone’s home. I was not comfortable trespassing. It was cold waiting outside, and the photographers were taking a long time. I hovered near the door, and finally inched my way in. It was a wreck. The whole house was cracked and crumbling. Ravaged. Debris lay everywhere. I looked to find traces of former inhabitants. It was just shards of junk. Little survived of past lives. The place was less haunted than I was. So I staggered back out the door, and took a few last shots of the house’s shell. It was still beautiful, even gutted and scarred. And it was still standing. Gutted ruin. That describes my heart. Although I can laugh and love life again now, there are days I wonder, what am I doing here? Sometimes it feels like I’m trespassing, like I don’t quite fit in with my company or surroundings, like I need to be extra careful not to offend anyone by talking about my loss. I consider myself a survivor though, as in: my daughter died of cancer but I survived. I’m gutted. Scarred. But still standing. When was the last time you felt like you were trespassing? 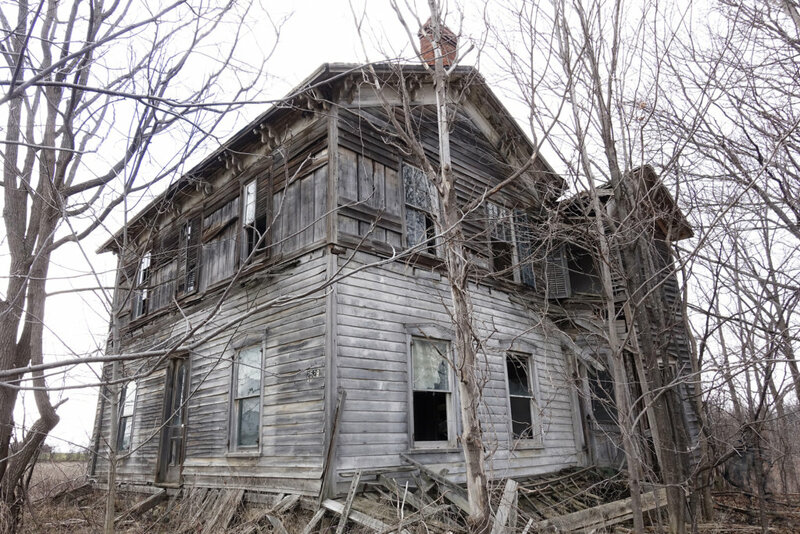 This entry was posted in 2017 and tagged abandoned house, do houses have souls, finger lakes photographers, haunted places, photographing in upstate ny, survivors, trespassing on 2017/03/20 by Robin Botie.